The abhorrent policies followed by the Taliban at government level in Afghanistan were completely incompatible with any basic notion of human rights, Alex Cunningham has said, and the West must continue to stand firm in promoting women’s rights in the country. The Stockton North MP was speaking after meeting several Afghan women in Westminster, along with representatives from ActionAid, ahead of today’s meeting of world leaders in the capital to review immediate priorities and analyse progress on the Tokyo Mutual Accountability Framework which made a series of commitments for Afghanistan’s development. Under the Taliban, Afghan women were placed in a deplorable position. Not only were they not allowed to be educated after the age of eight and permitted only to study the Qur’an until this time, but neither were they were not allowed to work. With women facing public flogging and execution for violating the Taliban’s laws, many women seeking education risked their lives by attending underground schools. Women in Afghanistan have fought back bravely to enhance their freedoms and real, albeit fragile and uneven, progress has been made in recent years. With the nation having a new president and unity government at the same time that NATO combat missions are ending, the London Conference comes at a critical time for Afghan women in ensuring that these gains aren’t lost. 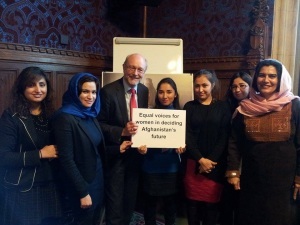 “Significant progress has been made in recent years around women’s rights in Afghanistan. Women now have the right to participate in democratic elections, are allowed to drive, and engage in other activities that would have unthinkable even ten years ago. “Importantly, there are now two million girls in school and enrolment has risen from just five per cent to over 34 per cent since 2002. This has helped reduce the number of Afghan women surviving on less the USD $1.25 per day by almost half since 2008. “However, while significant progress has been made, illiteracy amongst Afghan women stands at 88 per cent, while 85 per cent are unemployed or otherwise out of the workforce. Alarmingly, 87 per cent are subjected to domestic violence in one form or another.